Fall is here in Cherokee county and the metro Atlanta area and the leaves have begun to change color which while beautiful, means that soon they will be covering your yard. While a yard covered in leaves may have a certain charm to some people if they are not removed in a timely manner, they can cause damage to the lawn and landscaping that you’ve spent all summer taking care of. In addition if not removed they can cause a safety and even liability issue on sidewalks, patios, and decks. The easiest solution is to contact Hutcheson Horticultural for our seasonal lawn cleanup service. But many people insist on taking this chore on themselves. But saying you’re going to clean them up and actually doing it efficiently, are two different stories. So let us give you some tips to help make this year’s leaf cleanup as easy and enjoyable, as possible. When the leaves finally fall, don’t just go running out in to the yard with your old rake. There are many tools that can aid in the leaf cleanup process. Many of which you may already own. If you’re looking for a quick and easy way to tackle the fall leaves, a lawn mower with a bagging system or with a mulching blade, may be just the answer you’re looking for. If you have a small yard, we recommend using a mower with a bagging system to completely remove the leaves from your yard. If you have a larger yard, you may want to consider leaving off the bag and installing a mulching blade. If you’re the type that prefers to use something gas-powered for all of your chores, a yard vacuum or leaf blower may be the best option for you. One blows the leaves off of your yard, and the other one gently deposits them into a bag for easy disposal. Both of these are viable options for small to medium sized yards. One of the biggest mistakes we see made with leaf cleanup, is waiting until all of the leaves have fallen to finally try cleaning them up. Don’t do this! Due to the acidity level in leaves, leaving them on your lawn for long periods of time can cause your grass to yellow, and even die. Plus if your grass isn’t getting any sunlight, it will cause major problems in the springtime. 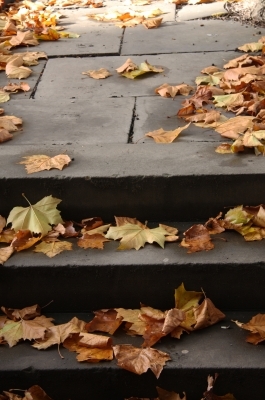 Make it a point to clear your yard of leaves on a weekly basis. Don’t have time for this ongoing process? Once again remember the landscaping professionals at Hutcheson Horticultural who can take care of your leaf clearing needs quickly, efficiently, and affordably. For seasonal or year round landscaping needs in Cherokee County and all of north metro Atlanta call us at 770-924-1001 or use the convenient “Contact Us” form on our website.